Deciding where to start telling the story of a long run is always a bit challenging; when the run in question is 24 hours and 73 miles long, finding an entry point is even more daunting. However, with the New Jersey Trail Series One Day now two weeks behind me, I figure I need to just sit down and get some of the experience written out before it fades too far into the past. I don’t expect this to be terribly linear, but then the experience itself wasn’t exactly linear either — rather it took the shape of the course itself, looping back onto itself again and again, much more temporal than spatial. But I digress already. 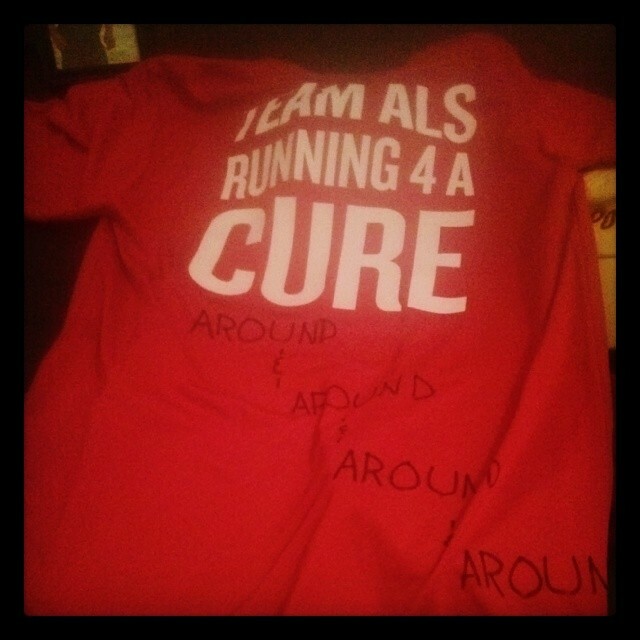 Before I give myself overly entirely to digressions, however, I want to once again thank all the people who donated to my fundraiser though CrowdRise: thanks to all of you, I raised $2,601 for ALS research and care. Your support and encouragement, as well as the thoughts of my uncle Chris and my friend Ian’s father and their current battles with ALS truly motivated me to push myself further and farther than I have before. But I was speaking I of my thoughts looping about like the course. . . I think I should start by describing the course. It’s sort of remarkable how well I can picture it in my mind, but I suppose 73 laps of the same mile will engrave most details indelibly in your memory. The course looped around the grounds of the Sussex County fair grounds in the hinterlands of New Jersey, roughly 90 minutes from Brooklyn. 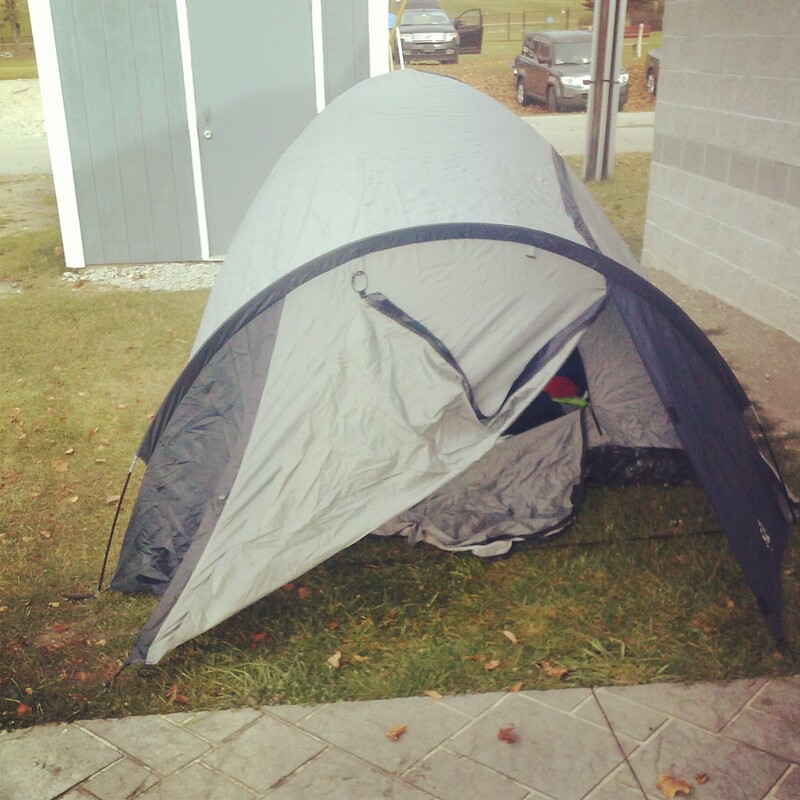 When I arrived there was frost on the grass and my breath was fogging the morning air as I pitched my tent just off the course route before picking up my bib. The starting line was set up between a large event barn and a concession kitchen, which was the aide station for the event. On one side of the starting mat, the table where the race director or one of his kids sat to shout out what lap you had just completed in case the large monitor flashing your name and distance didn’t get your attention; on the other side, tables stocked with pretzels, potato-chips, trail-mix and a variety of drinks. After running straight from the starting line, you took a right directly in front of the restrooms and the small patch of grass where I’d pitched my tent. The course then followed an asphalt road for about 50 yards, did a 180 turn around, following the road back towards a large parking lot and past a number of support teams who had set up tents or simply propped open the back of a van or SUV to supply their runnier with food, drinks, and new socks. There was a sharp right, up a very slight incline (“Walk the hills!” someone inevitably joked, but just as inevitably we all did, in fact, walk the slight incline as if it were a hill), then the course looped around the edge of the fairgrounds on a 20 foot wide service road, an empty parking lot to the left and a wall of brittle, autumnal trees to the right. After about a half a mile, the course cut a sharp left between some livestock pens and became rough gravel for about a hundred yards before turning back into asphalt as the path worked its way through the heart of the fairground. Then with a sharp right you were back at the start. One mile exactly. Again and again and again. This was the one question everyone asked, and honestly it was my biggest concern before starting: that the course would become so tedious and repetitive that the run would become more a feat of mental than physical endurance. Surprisingly, however, I never got bored of the course. Not once. 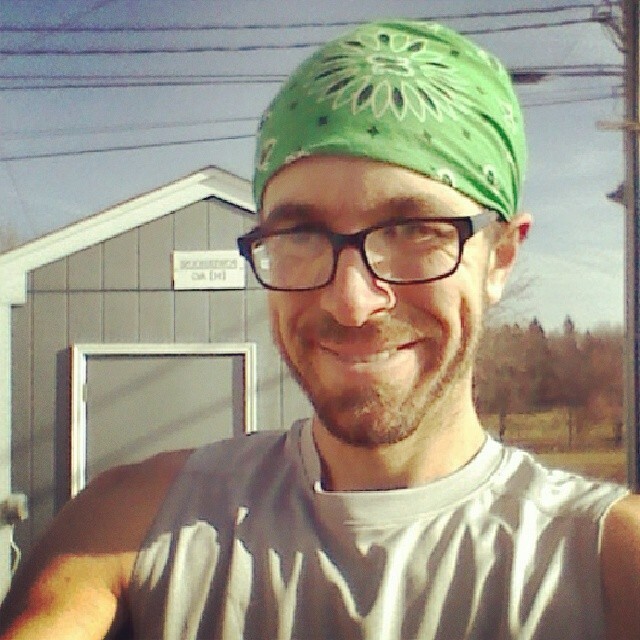 My body grew tired, and the slight hill at the edge of the parking lot eventually felt like a serious mountain after encountering it for the fiftieth time, but I never grew tired of running the same mile. It was repetitive. It was long. But it was never boring. Peaceful, painful, nearly eternal in the middle stretches, where one didn’t quite remember staring and couldn’t quite imagine finishing. But not boring. Never that. It’s odd to summarize a race in sections that are each the size of a marathon or even an ultra, but the first 30 miles went by easily. The day started off cold but clear — we had ideal weather, with a pale-blue sky and just enough chill to make you feel energized. I started with a long-sleeved shirt but ran much of the day in a singlet and shorts. The start of a 24 hour race is a funny thing, as no one sets out at a real “run” and there’s none of the usual jockeying for position or darting around slower runners. 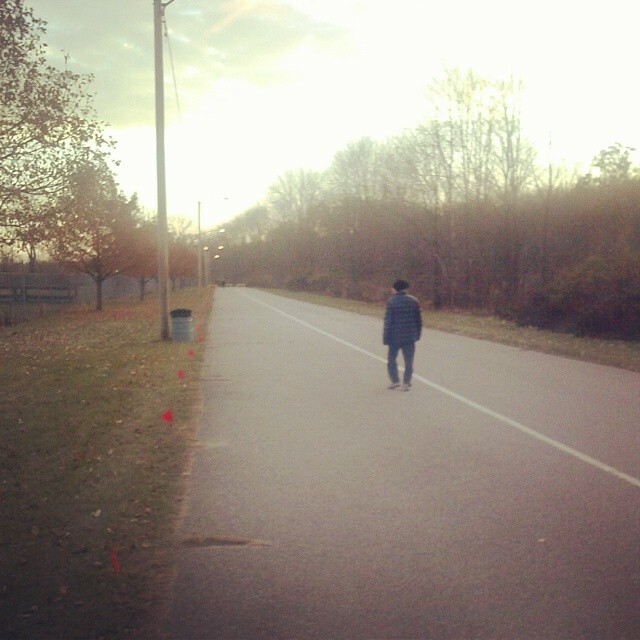 There were only about 50 of us anyway, and everyone started off at a respectable jog, or else just walking. My goal was to do 100 miles. Ambitious for my first 24 hour race, but I figured a 12:30 pace for 25 minutes and then a 5 minute walk break would be a sustainable pattern, and for the first 40 miles or so it was. I started out a bit faster, then slowed down somewhat, but generally just ran steadily and felt great. I talked to a few people here and there but mostly was quiet, content to be with myself and my thoughts. I didn’t have any music — my plan was to run without anything until night, then listen to an audio-book overnight, and finally break out the tunes to give me a boost in the final morning hours. At some point in the first 10 miles or so I made the turn at the top of “the hill,” and I was struck with the beauty of the autumn leaves and the crisp air, and overwhelmed with a sense of thankfulness and joy at having the opportunity to run on this day, at this place, at this event. The most common reaction when I would tell people I was doing a 24 hour race was that I must be insane to want to do that to myself, but all I was experiencing was pure joy. One of the few downsides of not believing in god is not having a focus for devotion. I did a slight salutation with hands folded in gassho, muttered an “Om Mani Peme Hung,” and then offered up a spontaneous prayer to nothing and no one in particular: “Thank you for this mile, and all the miles that preceded it. And thank you for the miles yet to come, whatever may occur.” That was the mindset I had and hoped to maintain for the race — not to merely accept whatever occurred, but to be thankful for it, regardless of how it turned out, to embrace with joy 100 miles or 50 miles, a triumphant finish or a twisted ankle and sudden end. I don’t know exactly how many miles I was into the race at that point, but for every lap after that when I made that turn I repeated my small personal ritual: folded hands, Om Mani Peme Hung, and my prayer of thanks. I must have repeated it 50 or 60 times more times at least. So I ran and ate, talked some and gave thanks and stopped to get a picture of myself at 26.2. Then 31 miles passed, and every step after that was a distance PR. 40 miles went past, and I was still feeling strong. Somewhere in the 40’s, however, my right knee started feeling a bit tight. My right knee is my one lingering ailment. It used to bother me a lot when I started running, but it hadn’t bothered me since the Brooklyn Marathon back in the fall of 2011. 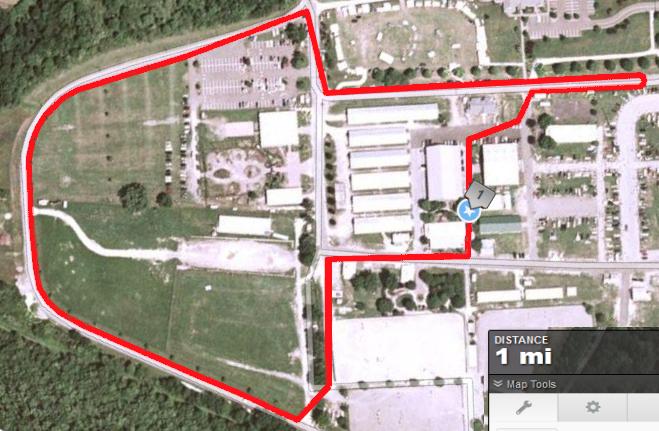 But then again, I’d never run this far before. This was frustrating because my muscles felt fine and I had lots of energy, but my knee didn’t want to cooperate. I walked a bit more, hoping I could just ignore it, and at some point the sun started to set, and since it’s winter in the North, it started to set early, and once it started its descent, vanished quickly. One lap it was the golden twilight hour; the next lap it was a dim dusk gloaming; then it was pitch black. My knee slowly started to feel worse and worse. Most frustrating was the fact that the transition from walking to running was what hurt the most, and of course taking walk breaks was the only way I would be able to finish the race. My feet started to hurt as well, so I switched into my minimal sandals, which made for a great conversation starter in a crowd largely shod in Hokas. After a bit more than eleven hours, I passed 50 miles. The race director shouted out that I was on pace to do 100 miles, but I only grimaced, as that would entail maintaining the same pace for another half a day, and with each mile I was slowing. 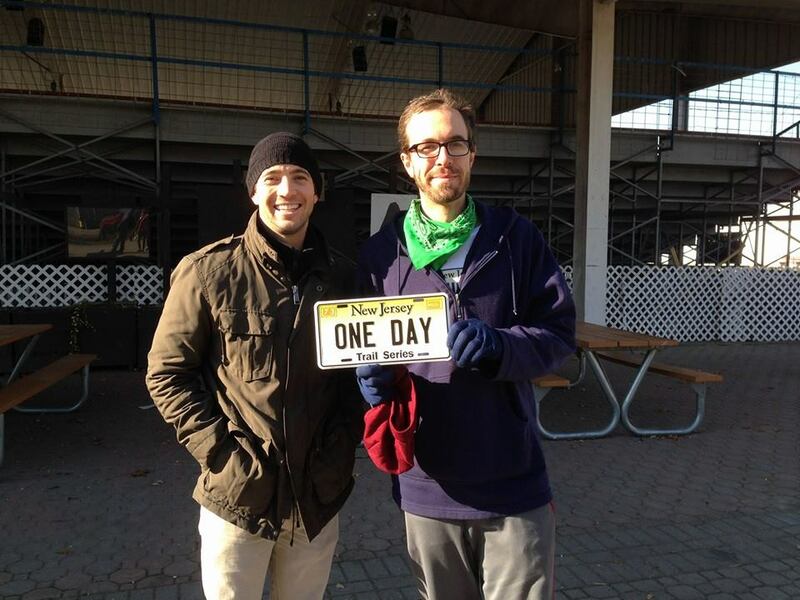 I finished 52 miles in 12 miles — almost 2 marathons exactly — and then I hit the wall. That night, in the dark, however, I hit a wall. My knee had been slowing me, but now my run, which had always been more of a jog, started to be more of a shuffle. With the sun down, the temperature dropped into the 30s, and the slower I ran the less body heat I generated and the colder I got. 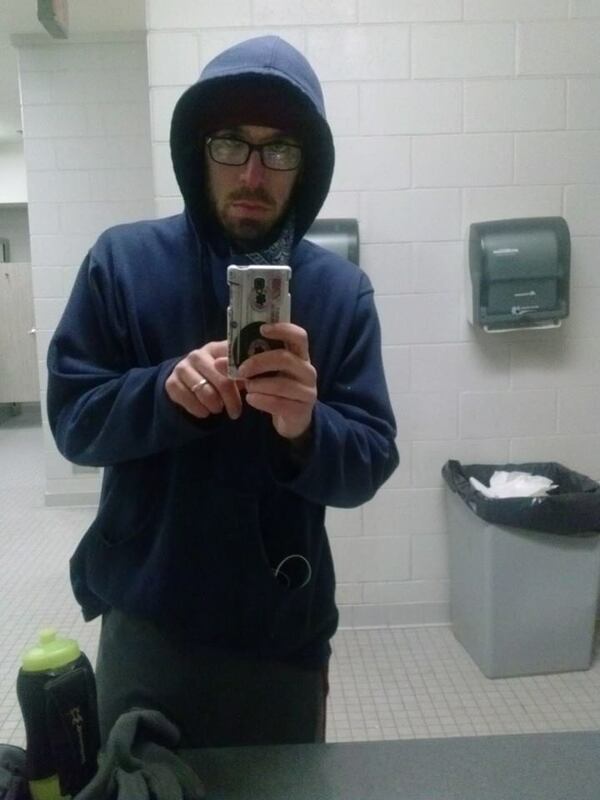 I lost time struggling into running tights and my jacket, then added sweatpants, and a hoodie. Two layers of socks, two layers of gloves, two hats — and I was still cold. I broke out the audiobooks that my coworker, Roger, had lent me on an old iPhone, but it wasn’t as focusing as I’d hoped; I was merely too exhausted to concentrate on either the narrative OR my running. After knocking out 52 miles in the 12 hours before 9 PM, it took me over 3 hours to finish the next 6 miles. I still was offering up my prayer of thanks every lap, and somehow, as incredible as it may sound, I was still taking joy in each lap, but things were coming apart quickly. My feet hurt, my knee hurt, and I couldn’t get warm. After shuffling over the starting mat for mile 58, I sat on a bench and took stock. 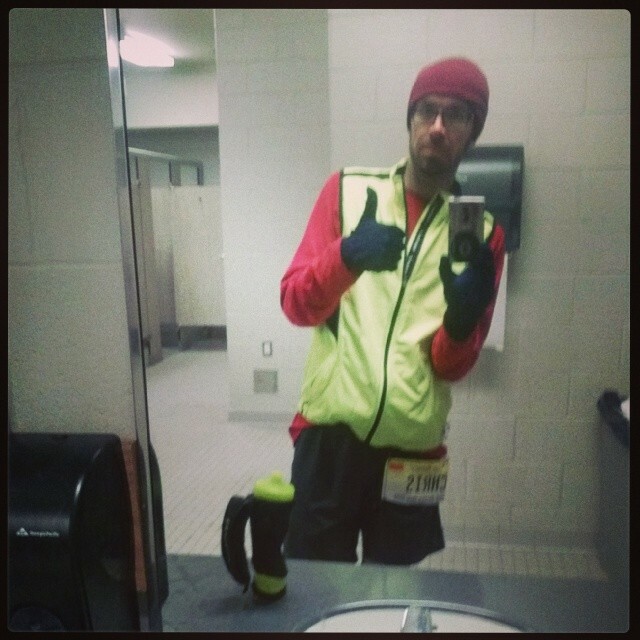 For the last three laps, I had only managed to stumble around the course at a 30 minute mile, and since I couldn’t go any faster, I wasn’t going to be able to get any warmer and I was already wearing every layer I had brought with me. Forget finishing, I was beginning to worry about getting hypothermia. I had to admit it — I needed a break. Forcing myself to keep moving was at the best pointless, at the worst, injurious. There was no way I was going to make my goal of 100 miles, as suddenly breaking into a run for the next 11 hours wasn’t happening. I’d done 50 miles, which was a distance I’d never run before. I decided a radically scaled back new goal could be 100K (62 miles), and if I got some sleep and woke up at 7 that would get me a little over 6 hours of sleep and I’d still have 2 hours to get in 4 miles. I didn’t feel bad about giving in; at that point, I really felt I didn’t have a choice. It wasn’t a lack of dedication — the spirit was willing, but the flesh was weak. One of the reasons I’ve pushed the distances I’ve run is that I’ve been looking for a limit, a point of failure that would let me know I’d hit some sort of extremity past which I simply couldn’t go. The fact that I’ve completed each new distance left me with the lingering doubt that I hadn’t pushed myself hard enough or far enough. Staggering into the restroom at 12:45 before heading to my tent, however, I knew for certain that I’d pushed myself as far as I could go — at least for the time being. There was a limit to how far stubbornness, grit, and determination will take you without actual training. I’d prepared for the race by simply sticking to my regular 30 mile weeks, with one 31 mile training run thrown in in for good measure. Obviously, that hadn’t been enough. The last few hours have been some of the most humbling of my life. It took me 12 hours to run 52 miles, and 3 hours to stumble the last 6. A 30 minute mile isn’t keeping up my body temperature, and since it’s so cold, I think I have no choice but to call it a night at 58. I’m going to try to get up at 7 and hobble out 4 more for a 100k, but this might be it. Then I went to find my sleeping bag. My body seemed to take the point of actual surrender as a signal that it could give up as well, as I suddenly became horribly nauseated, and had to rush to the garbage can where I spent a good three minutes violently throwing up everything I’d eaten over the last 12 hours. I threw up repeatedly until my stomach was entirely empty, waving off a few supportive runners while insisting I was fine. I managed to get back inside to a sink, rinse out my mouth, then stumbled the 20 feet to my tent. I found a handkerchief to wipe my face with, pulled off my sandals, then crawled into my sleeping back wearing all my various layers. I was a bit concerned when I realized I couldn’t straighten my legs all the way; I tried massaging my muscles, but my hands were mostly numb and I eventually just accepted my knees would remain bent. 58 miles in a bit over 15 hours. I thought I had 4 more in me in the morning, but was also resigned to the fact that I was most likely out of the race. I set an alarm for seven and was asleep almost at once. 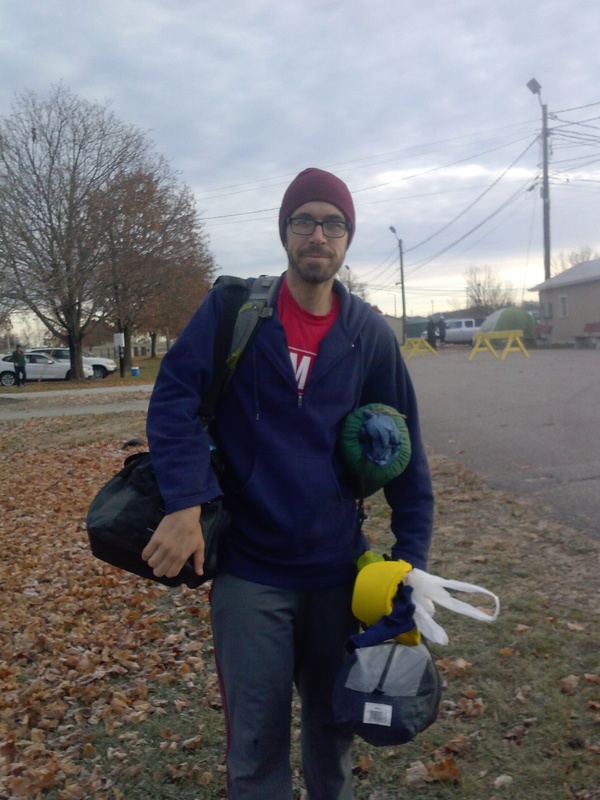 At some point I half awoke and became aware of voices, the sounds of people chatting down at the aid station on the half hushed tones that one uses at a campsite in the middle of the night. Is it morning already? I wondered. My phone read 3:45 AM. I’d been out for three hours, and had more than three hours until I had to get up. I stretched my legs, and I could straighten them. My muscles were sore, but I could move, and my head was clear again. I lay on my back staring at the tent. When I had passed out a few hours before, I hadn’t had a choice: I had to stop. Now, however, I realized I did have a choice. I was sore, I was tired, but I was capable of getting up. If I didn’t get up now, I would be choosing to quit. Last night hadn’t been the test of my limits — right here, lying awake at 3:45 was. That was the point where running the event for a cause really came to the front of my mind. I though of my uncle. I thought of Ian’s dad. I thought of all the people who wanted to run or walk but couldn’t, the people whose every day entailed more pain and struggle than my last 12 hours. I thought, All I have to do is walk one mile. I can always quit again after that. Somehow I crawled out of my sleeping bag and took stock of my body. Every part of me hurt, but I was coherent, even oddly energized now that I’d made my decision. I peeled off my socks, and was a bit horrified at the number of massive blisters covering both my feet. I probably should have noticed them hours before I quit for the night, but I had been so uncomfortable and unfocused that I hadn’t paid attention to them. Wincing, I put on new socks and managed to squeeze my feet back into my shoes. The predawn air was bitterly cold as I stumbled out of the tent, the mid autumn constellations still bright in the sky as I made my way around the track once again. The course was almost deserted, with very few runners still grinding away at this hour. With each step I felt better, stronger, more awake. And 3 hours and 40 some minutes after I’d crossed the finish line for the 58th time, I crossed it for the 59th. I got a blister kit from the aid station and spent a few minutes lancing and bandaging my feet, and when I started on mile 60 I felt indescribably better. The kitchen made me a grilled cheese sandwich, and the next lap had breakfast burritos and slices of caramel apples. I couldn’t run, but I could walk at a decent pace, and sometime long before dawn I finished 100K and kept going. Eventually the sun came back. I greeted it with my ritual of thanks, and managed to honestly be thankful even for the long, painful hours from the middle of the night, for the blisters and vomiting and aching muscles. How could I not be thankful? I was still moving forward, still awake to hear the birds awaken and see the rosy fingered dawn stretch out from the East and cast its pale light across the New Jersey hills. Slowly more runners rejoined the course. Someone gave me an encouraging, “Keep it up!” I responded, “I figure I just have to stay on my feet — the end will come to me.”. Because in a 24 hour race, the end DOES come to you, and at the same speed it comes for everyone else, elite or amateur, young or old, running or walking. Minute by minute it comes for you, and everyone reaches the finish line at the exact same moment. No one has a second more or less: it is simply a matter of what you manage to do in those allotted 24 hours. At some point the thought crossed my mind that the end of this race is a bit more like life itself than most races: that the end will eventually find you whether you are running or sitting on a bench, walking the course or sleeping in your tent. You don’t have to DO anything to finish; its simply a matter of how much you manage to finish that is in question. For a few miles I hoped I could speed up enough to finish 78, to make it three marathons, but I settled in at walking a 15 minute mile tops and would gladly take whatever I could get. After 62 laps, the few I would be able to get in seemed like nothing at all; then I was across the finish line with 25 minutes left, knowing I could get in one last lap but not two, so it was walked with an oddly unhurried finality. I crossed the finish line about 8 minutes to 9, and my cousin and his girlfriend were there, having arrived to drive me back to Brooklyn and making it just in time to see me cross the finish (or perhaps the start?) for the 73rd and last time. Its really hard to answer the question, “What was it like?” It was easily the hardest thing I’ve done, beating GoRuck without a question. It wasn’t “fun” per set but I enjoyed it, took joy from it, and loved every minute of it. I finally found that limit I’ve been searching for, and truly learned something about myself in the freezing pre-dawn moments lying in my tent. The question isn’t “Will I do another 24 hour race?” but rather, “When?” When thinking back on what I did right and what went wrong and what I would do differently next time, I realized I love the nearly epic sweep of the strategy, pacing and fueling broken not into miles or minutes, but four or six hour blocks, the same self-knowledge and reassessment of a 5K, bit slowed down and stretched strategically over an entire day. I learned to respect the distance of 100 miles, to realize that not all goals can be reached by flippant bravado and determination. So far my distances have been reached mainly be willpower without any real training; I don’t think one can BS one’s way to 100 miles the way one can with a marathon or even 50K. Of course, the event was timed. In a race without a 24 hour cut off, could I have made it 100 miles? I don’t know. I do know that the first 50 came pretty easily, so I’m thinking I’ll train for and race a 50 mile race first. Physically, I recovered quickly. I’m not sure if was due to not ever running that fast or all the walking at the end or the three hours of sleep, but after resting Monday I walked the five mile roundtrip to my school Tuesday, and jogged it Wednesday and Thursday. There was actually more mental recovery; it took most of the week before I could stand how incessantly my students talked, and I responded to everyone with a slightly distracted delay. I missed the silence, the constant, steady movement forward. And then there’s the mild depression that follows the accomplishment of any large goal, as suddenly there is this massive hole in your life where that future event once lived, no longer looming ever present but rapidly diminishing into the past. But it is done. And for now I’m content with my daily commute, and can focus again for a while on picking up my speed. I’m not sure what my next epic run will be, but there will be one. All in good time. And in the mean time, I give thanks for this race, this day I sit here typing and all the days that have came before. And I give thanks for the days to come, whatever they will bring. Om mani peme hung. 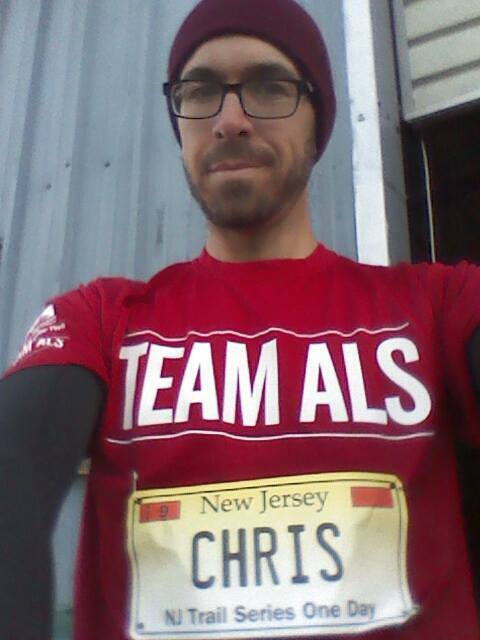 This entry was posted in Uncategorized and tagged 24 hour race, new jersey trail series, races, ultra. Bookmark the permalink. Gosh, Chris, this essay was such a wonderful, introspective, spiritual experience to read. Thank you so much for taking the time to write it. It makes me proud to be your Mom!